I spend so much time picking okra on our farm that one of my friends gave me the nickname “Okra Winfrey.” It is hard work because the okra plants are very prickly and I have to wear long sleeves and gloves in this August weather. But it has its reward. If I am harvesting in the morning, I get to watch as the lovely okra blossoms open up. 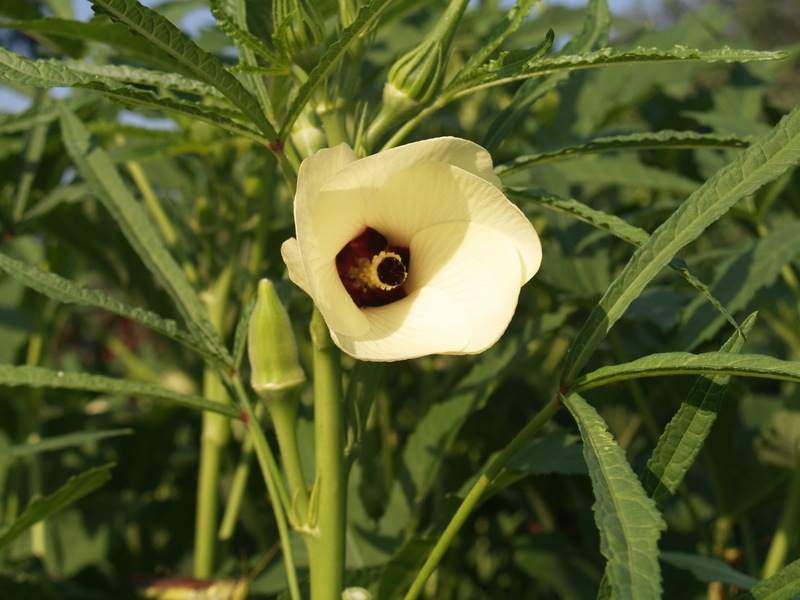 You can tell by the flower that okra is in the mallow family like hibiscus and Rose of Sharon. While I am harvesting, I will occasionally see a small tree frog perched on the leaves. I don’t need a study to tell me that the surge of joy I feel at seeing a tree frog is good for my health. Harvesting is a also decompression time for me when I can peacefully think about things like new blog ideas. You might have experienced the health benefits of being in the outdoors also. Have you ever taken a walk and felt better? Some people consider nature to be an essential nutrient like protein or water. The term nature deficit has been coined for our common modern condition of reduced interaction with the natural world. Studies are showing that this deficit can contribute to attention difficulties, cognitive issues, reduced impulse control, poor stress response, and emotional and physical illnesses. On the other hand, researchers found that as little as five minutes in a natural setting improves mood, self-esteem, and motivation. In another study, a walk in the country reduces depression in 71% of participants. Studies also indicate that we recover from stress faster when we are in a natural setting. Experiencing nature can lower heart rate, blood pressure, and levels of cortisol, the stress hormone. Outdoor activities are great for family bonding also. For inspiration and tips, go to the website for the Children & Nature Network. This entry was posted in Health and tagged health, nature, stress. Bookmark the permalink.